I already blogged about one of my favorite presentations at Metricon in which Bryan Ware showed a model of combining risk and effectivness to identify areas to focus on. Of course, the upper right quadrant of highly effective controls for high risk items make sense to fund, but the harder choices lie in quadrants 2 & 3. Would you rather really make a dent in solving a relatively lower risk problem or partially solve a higher risk item? 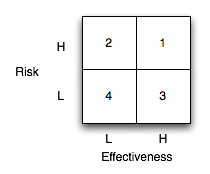 Bryan's guidance was to incentivize high effectiveness (quadrant 3) over lower effectiveness (quadrant 2). This is a bold move, because it may be seen as ignoring higher risk items, however in the long run it may drive organizations to work towards higher effectiveness. One area that organizations struggle with is - how to get started in application security? There are a lot of types of controls to consider like static analysis tools, sdlc, threat modeling, strong authentication, federated identity and so on. I have seen several enterprises conduct tradeoff analysis on Web App Firewalls (WAF) which offer some protection web applications from SQL injection and the like and XML Security Gateways (XSG) which protect XML messages and Web Services. So I used Bryan Ware's quadrant to analyze where it would make sense to focus efforts if an organization could choose only one. This is at the 20,000 foot level and both risk and effectiveness are subjective, so YTMMV (Your Threat Model May Vary). If we assume that risk is higher in the apps that WAFs generally protect, Internet facing portals, than in what XSGs generally protect, say B2B apps on VPNs. 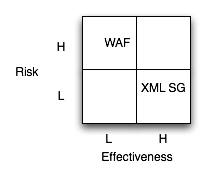 Then the WAF goes in the higher risk quadrant than the XSG. If we further assume that WAFs use a lot of educated guesswork due to performance constraints of signature and anomaly detection on unstructured data in web apps speed then their relative effectiveness is downgraded versus XSGs that may operate on asychronous systems on structured data, and, of course, XSGs can leverage interoperable security standards like WS-Security whereas WAFs rely on patter recognition. Then the relative effectiveness may prove higher for XSGs, again YTMMV. Assuming the above, the decision looks this way. Depending architecture, threat model and other factors a XML Security Gateway may be a logical choice if you have to choose since it may prove to have higher effectiveness than a WAF. Of course, these need to be mapped to your particular organization, and there are a lot of other controls to consider besides these two, but in my view this model works really well as a decision support tool for hard security architecture choices. "Captchas are a nice idea to protect your blog or guestbook from being spammed by robots. But what good is this protection when you can hire "data entry specialists" to solve captchas for $0.60 per hour for 50 hours a week? Anyone here who can think up a solution that does not include drastically changing the global economy? How about captchas that require cultural background knowledge to solve?" Who won the world series in 1973? #7 Not Planning for Web Services Security Organizations tend to start small when first building SOA with Web services. The extent to which Web services technology grows within a given environment is typically related to the comfort level developers and architects have with the overall technology framework. Once services begin to take on greater amounts of processing responsibility, the need for message-level security measures as well as security controls that apply to shared services begin to arise. The WS-Security framework establishes an accepted security model supported by a family of specifications that end up infiltrating service-oriented application and enterprise architectures on many levels. Hmmm...infiltrating...I like that. Let me infilitrate your car with airbags and ABS. So if I turn this "Not Planning for Web Services Security" around can I say we should Build Security In to our Web Services? It is hard to retrofit security, and not that hard to build it in in the first place. You don't have to go back and restest and redeploy all your transactions for example. WS-Security (and SAML) is a good place to start, then move on to WS-Trust, XACML, et. al. It is still surprising when you talk to vendors, like ESB vendors, who should be in prime position to take advantage of WS-Trust yet they really don't even have it on their roadmap yet, in some cases. Security is part of the friction that comes with integration. As mentioned in Only Sustainable Edge, the real trick in integration is making sure that the friction is productive friction and not dysfunctional friction, Web Services security standards give a clear path to that, because they deliver interoperable message level security which the industry has heretofore lacked. So systems may emerge from a Web Services integration with security domains that can compose together instead of representing abritrary boundaries because of technical constraints. Ok, it may well be diseconomic for businesses to build systems that have enough security assurance to withstand targeted attacks from a determined, well funded foe, like say, a foreign spy service. But shouldn't our identity systems be at least strong enough to fend off meth heads? Meth users — awake for days at a time and able to fixate on small details — were looking for checks or credit card numbers, then converting the stolen identities to money, drugs or ingredients to make more methamphetamine. For these drug users, Mr. Morales said, identity theft was the perfect support system. Mr. Morales, director of the Denver district attorney’s economic crime unit, said 60 percent to 70 percent of his office’s identity theft cases involved methamphetamine users or dealers, often in rings of 10 or more. Often identity theft rings organize like meth labs, where one person has the technical skills and others gather the raw materials. In an identity theft ring, one person might work the computer and the others steal identities or use the fraudulent checks or credit cards to get cash. In Minnesota, meth laboratories and users developed a barter economy of washed checks, stolen checkbooks, drugs, ingredients and equipment, said Carol Falkowski, a spokeswoman for Hazelden, a drug treatment center in Center City. In rural parts of Salt Lake County, Utah, meth addicts take their stolen identities onto the Internet because it has more targets than the local area, said Pat Fleming, director of county substance abuse services. “Meth is one of the major things driving identity theft in Utah,” Mr. Fleming said. People underestimate the resourcefulness of thieves, she said. Proposed Amendment to the Laws: The identity metasystem should be resilient to attacks by meth heads. Law 2 which is of course minimal disclosure for a constrained use, is one of the main laws violated that provides the opening for the identity thieves. In Leuven at OWASP App Sec conference, the participants in my SOA, Web Services, and XML Security class, we built this set of security metrics for measuring security in a Web Services environment. 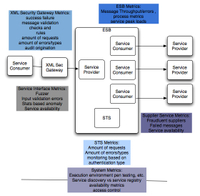 The metrics map examines specific metrics for a XML Security Gateway, a Security Token Server (STS), the ESB, the system, and services. This is not a complete set, but it addresses many areas where commercial systems are blind. Web 2.0 and Security Too? The actual XML message is contained in the HTTP request and security is provided by HTTPS, which is the secure version of HTTP. This, in a nutshell, is virtually everything that a Web service user or creator needs to know about REST. SSL? Ok, deep breath. How can you say this Web 2.0 when your security model is not even sufficient for Web 1.0? Of course, there are ways of writing more secure code in a REST-ful way but they depend heavily on the correctness of the developer's implementation, and since we have 10+ years of evidence as to developer's "ability" to write secure web apps, this should cause concern. So when you need to deal with a REST vs. SOAP question, one of the things to analyze is how is REST going to deal with what WS-Security, WS-Trust, and SAML already do in a WS-* architecture, like encrypt and sign messages, and suppot multiple token types. Simply ruling out choice a for developer convenience is not a fair tradeoff. The WS-* v REST debate rumbles along, one thing I have never understood is why when a new technology or language comes into play it suddenly has to answer all existing use cases? There are some use cases which are better suited to WS-* and some that are better suited to REST, there are even some where it makes sense to use both at different layers in the system. From a security standpoint REST has a ways to go to deal with the use cases that WS-* does, however one of my "real world" architectural rules of thumb is that "working code trumps all", and so REST gives a more efficient path to that and so you have cases where you may need interoperate becasue REST is already there and it did not require a bunch of infrastructure. For example, how about a case of bridging a REST client that needs to speak through some app to get some data from a back end speaking SOAP/XML/WS-Secruity? WS-Trust can exchange the REST credentials for SAML assertions that may be used by the WS-Security message for access control by back end services.